alaTest has collected and analyzed 101 reviews of Sunco® DREAM 2 Action Video Full HD 1080p 12MP Waterproof Sports Camera With 1.5 -inch High Definition Screen (Black). The average rating for this product is 4.0/5, compared to an average rating of 4.0/5 for other Camcorders for all reviews. Reviewers really like the image quality and portability. The color and usability are also appreciated, but opinions are divided on the size. We analyzed user and expert ratings, product age and more factors. 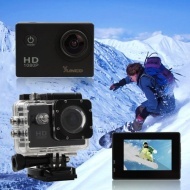 Compared to other Camcorders the Sunco® DREAM 2 Action Video Full HD 1080p 12MP Waterproof Sports Camera With 1.5 -inch High Definition Screen (Black) is awarded an overall alaScore™ of 84/100 = Very good quality. alaTest has collected and analyzed 100 user reviews of Sunco® DREAM 2 Action Video Full HD 1080p 12MP Waterproof Sports Camera With 1.5 -inch High Definition Screen (Black) from Amazon.com. The average user rating for this product is 4.0/5, compared to an average user rating of 3.9/5 for other Camcorders on Amazon.com. People really like the image quality and portability. The color and usability are also appreciated, but opinions are divided on the size.